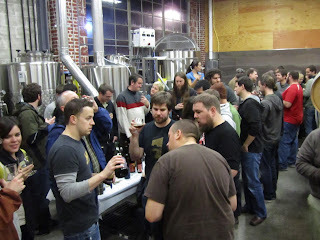 As a sort of pre-func for Hair of the Dog's dock sale last weekend, there was a well-attended beer-geek bottle share Friday night at the new Commons Brewery (née Beetje) facility at SE 10th and Stephens. The dock sales have traditionally inspired impromptu breakfasts and sharing of rare beers as people waited in line, but it's just not possible to do that at the new place at Water and Yamhill. So HotD owner Alan Sprints looked around for a place to hold a party the night before, and Mike Wright generously opened the doors at Commons. There were probably a couple hundred bottles opened and shared around: various Hair of the Dog vintages, unmarked homebrews, rare imports, and cult favorites like 3 Floyds Dark Lord Imperial Stout. If you were standing in the right place at the right time, you might get a little pour of Dark Lord, or some 4-year-old Fred from the Wood, or something sour from Drie Fonteinen. I brought the Rogue/Voodoo Doughnut Bacon Maple beer that I won a couple weeks ago -- a good thing to share since no one wants a big glass of that but most people would like to say they've tried it. It was a little too sweet, but wasn't as bad as I'd heard and feared it would be -- actually it tasted a lot like a doughnut. Definitely worth a try just for the fun of it. 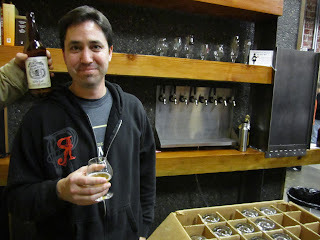 To compensate for that somewhat whimsical entry, I also brought a Rahr and Sons bourbon-aged Winter Warmer that Portland Beer and Music founder Jason Wallace brought me from Texas. Not that they need winter warmers down there, but it was a solid holiday ale with a nice whiskey/oak touch to it. For most of us, it was our first look at the Commons. I don't think the tasting room has regular hours yet, but a few taps were already hooked up, and barrels full of beer were scattered through the room. There's a nice feeling to the place, and while I wish Mike had kept the funky, unpronounceable Beetje name, it's great to have a new brewery in the neighborhood. His Belgian-inspired beers have all been very well-made so far, usually on the lower-alcohol end of the scale, and while there are some similarities with Upright's farmhouse line, there are enough differences to keep it interesting. Weekend tasting-room hours should begin before the end of the year. I didn't have an extra $90 burning a hole in the pocket that made me want to stand in line for a six-pack of Adam from the Wood the next day at Hair of the Dog, though I might have been tempted by sub-$6 bottles of Bourbon Fred from the Wood if I'd known about them. There was a lot of grumbling on Beer Advocate about the poor organization of the sale. While that's not a big surprise for a sale at Hair of the Dog, I do sympathize with people who were effectively punished for trying to pay with cash instead of plastic: apparently the credit card orders were collected up first, which had the effect that some platinum-plus people further back in line were able to buy Adam FTW ahead of those waving greenbacks around. That's rather perverse, since card fees take a bite out of the brewery's haul. But you should also read Jim Bonomo's hilarious rant -- complete with crybaby graphic -- that shows no sympathy for people complaining about the first-world problem of not being able to buy a few bottles of a rare and highly-prized beer. Glad to see the Rahr beer making into to a wider audience! Sounds like it was great time. I look forward to visiting Commons on my next trip to PDX. Cheers Bill! There were two people taking cash or credit cards and only one taking just cash at the sale. Why would people think the cash line was quicker? Alan: I wasn't there, but reading the BA stuff, I think the complaint goes something like this: 1. Orders will get filled based on place in line, not based on method of payment; 2. I will do Alan a favor by paying with cash instead of credit; 3. For trying to do that favor I was punished by effectively getting moved back in the line. I'm not bashing you for the way it went down. Like I said, it's a first-world problem. Or like Jim said, they could have gotten in line much earlier. But I can feel the pain of the cash people, especially since they thought they were going out of their way to boost Hair of the Dog. Thanks for the shoutout Bill. For me, it was all about the bottle share. No pressure (unless you needed to make sure you got your 0.75 oz of Brandy Vanilla Dark Lord) and good people. If they knew what the next day had in store, perhaps many would be handing out Ipecac-laden beer or sharing botulism cheese dip? All about the sharing. Reminded me of the community vibe of the old dock sales, which is way better than the FredFest transition vibe.